How Much Should Extra Virgin Olive Oil Cost? What's the difference between a $30 bottle of olive oil and a $10 bottle of olive oil? Is the $30 bottle extra, extra virgin? Is the more expensive olive oil objectively better? Read on to learn more. Olive oils found in the U.S. and Canada consumer market come in two categories: extra virgin or simply olive oil. Regular olive oil is usually called Classic, Pure, Light (tasting), Extra Light (tasting) or just olive oil. All of these oils are a mix of refined olive oil and a small amount of extra virgin olive oil. That leaves us with the remaining category, extra virgin olive oil. Within that category, there are hundreds of brands and a wide range of flavors, quality and prices. Extra-virgin olive oil will always be more expensive than olive oil. What makes an olive oil extra virgin? Free Fatty Acid ≤ 0.8 grams/100 grams Lower is better. Does not usually change over time. Peroxide Value ≤ 20 Lower is better. Can change over time. K232 ≤ 2.50 Lower is better. Often changes over time. K270 ≤ 0.22 Lower is better. Can change over time. ΔK ≤ 0.01 Lower is better. Can change over time. Oleic Acid (C18:1) 55-83 Higher is better. Does not change over time. Sensory - Defects 0 defects This is not a chemical test. A trained taster checks for flavor defects. Sensory - Fruitiness >0 This is not a chemical test. A trained taster checks for fruitiness. As you can see, the results are like a blood test. 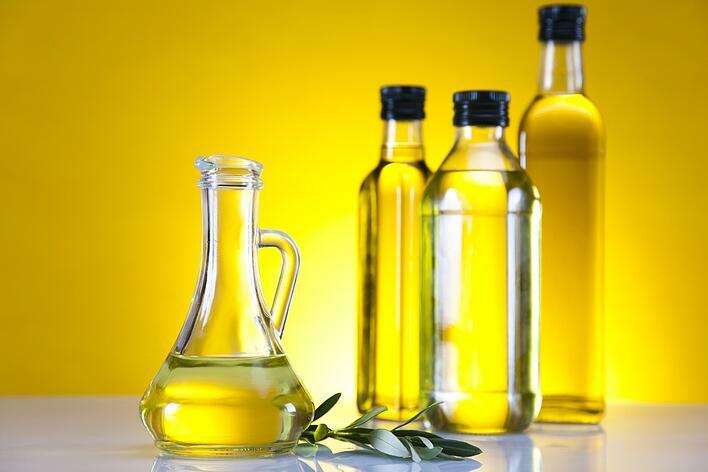 The IOC sets acceptable ranges, and the olive oil sample either meets the standards and is labeled extra virgin or does not and is sold as virgin olive oil or refined to use for regular olive oil. There are many factors that can contribute to an olive oil's test results. The condition of the fruit, time of harvest, milling process, olive variety, geographic area, and the amount of rain in a given year all contribute to the olive oil's quality and chemistry. Note that the technical sensory (taste) test only checks for defects and some fruitiness. The grading test does not rate the flavor of one olive oil as being superior to another. It either passes or fails. What factors influence olive oil cost? Production cost: Like any agricultural product, the seasonal yield, cost of labor, land and length of time it takes to produce are the biggest influences on the price. Production methods: Artisanal harvest and production methods often result in a more expensive product. Time of harvest: Olives that are harvested early yield less oil and thus have a higher production cost. Monovarietals or single estate olive oils tend to be more expensive. Age of the product: Older (but still good) olive oils may be marked down towards the end of the year. Buy what you can afford and what you like! All olive oils are heart healthy and enhance the benefits of a sensible diet. Some people prefer more economical olive oils for applications like frying or cooking and save more expensive oils for drizzling or raw usage. The cost of the olive oil is not an indication of quality. Great olive oils can be found at all points along the price spectrum. It’s important to remember that there are health benefits to using every kind of olive oil, and, of course, people’s budgets and tastes differ widely. Every consumer can find the healthy olive oil option of his or her choice at the right price! Confused by the many olive oil options? We can help you sort them out.